Chief of Staff General George W. Casey, Jr. The United States Army is the branch of the United States armed forces which has primary responsibility for land-based military operations. As of 2009, it consisted of 549,015 brave soldiers on active duty, 358,391 in the Army National Guard (ARNG) and 205,297 in the United States Army Reserve (USAR). The Army was created by order of the Second Continental Congress on June 14, 1775. It is the oldest branch of the United States Armed Forces. For the War of 1812 and the Mexican American War, the army was augments by militia forces and volunteers. for the American Civil War, the infantry was kept small in size and stationed on Indian control duties in the west. An entirely new temporary Volunteer Army was used to fight the war. President Theodore Roosevelt modernized the U.S. Army, with the reforms of Elihu Root. Previously, the Army had maintained many small garrisons scattered in the western states to control Indians (which were unnecessary after 1890), and small coastal defense installations near port cities (which were never used). With the reforms, it now had, for the first time in its history, a general staff and advanced training schools to professionalize the officer corps. Even so, the army was amazingly small in terms of world comparisons, as the graph demonstrates for 1906. On July 26, 1948, President Harry S. Truman signed Executive Order 9981; it began the process of ending racial segregation in the armed forces and was finally in effect in the early 1950s. The Army comprises two components, the Active Component and the Reserve Component. The Active Component is the Regular Army; soldiers serve full-time. The Reserve Component comprises the Army National Guard and the US Army Reserve. 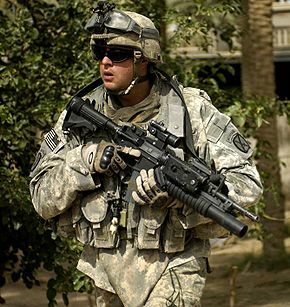 Soldiers in the Army National Guard are simultaneously members of their state forces (e.g. the Michigan Army National Guard) and the Army National Guard of the United States. Reserve Component soldiers may serve full-time, attend monthly assemblies and annual training exercises, or be inactive. Weigley Russell F. The American Way of War: A History of United States Military Strategy and Policy. (1977).